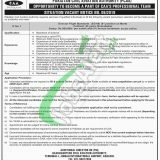 This page is about Civil Aviation Authority Jobs 2019 | CAA Jobs 2019 Application Form www.caapakistan.com.pk. Applications are being invited from the Pakistani nationality holders from the CAA Pakistan which is currently looking to hire the well disciplined, calibre and well experienced plus responsible applicants to fill out the following posts. CAA Pakistan announced jobs are (Director Flight Standards (EG-09)). The vacant post is going to recruit on open merit basis and due to this individual from all over Pakistan can apply for the vacant position as per the policy of Civil Aviation Authority Pakistan. Appointment of the above-mentioned positions will be done on the pure contract basis and the duration of the contract is extendable on satisfactory performance. Candidates from all over Pakistan can apply for these posts. These posts carry attractive salary package with the wonderful atmosphere will be provided to the applicants. So, after having such details let's have a look at its applying criteria below. CAA is abbreviated as Civil Aviation Authority of Pakistan is the Federal Government Authority which is under the Government of Pakistan which looks after and regulates the civil aviation authority of Pakistan and also checks out the conduct the air safety and investigation of flights. So, as far as Masters to Graduation level and offers Govt sector jobs and Latest CAA Jobs 2019 Pakistan are given below. Qualification: Bachelors in Science from HEC recognized university is required to apply. Age Limits: Age should be 62 years. Interested candidates should submit their application via online at the official site of CAA Pakistan or through web link given below. Candidates will be required to upload Detail CV, recent Photograph, Scanned Copies of CNIC, Domicile, all Educational Documents and experience certificate while applying for the job. The CAA Jobs 2019 last date for submission of application is April 22, 2019. In case a candidate does not upload the above documents with the online application form, his / her application shall be rejected. Test / Interviews will be conducted at Karachi, Lahore, Islamabad, Peshawar, and Quetta for which separate notices will be issued. Last Date to Apply: April 22, 2019. Address: Additional Director HR (TM), Headquarters Civil Aviation Authority, Terminal-I, Jinnah International Airport, Karachi.